Tonight we had our parents and my Oma over for dinner for Grandparents Day. (Yes, it was Grandparents Day – quick, get a card, send an email or call them just to say hi and you appreciate them.) I wanted to make something different for my vegetable instead of the same ole same ole. Since I had zucchini in my fridge I decided to do a search online and found this fabulous recipe on the kingarthurflour.com website. It is AMAZING! I highly recommend making this! On a side note, the sweet onion dip also tasted great with our pork chops and french bread! 1. Melt the butter in a medium frying pan over moderate heat and add the sliced onions. Cook, stirring occasionally, until the onions soften, then caramelize. This should take between 10-15 minutes. The lower the heat, the longer it takes but the less likely you are to burn the onions. 2. Once the onions are a medium brown, remove from the heat and add the vinegar. 3. Place the onions and vinegar into a small food processor. Add the honey and mustard, and process or blend until smooth. 4. Add the mayonnaise and salt and pepper to taste, stirring to combine. Refrigerate, covered, until ready to serve. 2. 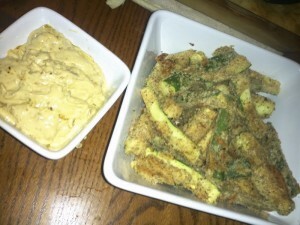 Place the zucchini sticks in a colander over a bowl and sprinkle with the tablespoon of salt. Let the zucchini drain for 1 hour or longer; rinse and pat dry. 3. Combine the Panko, Parmesan and pizza seasoning. Set aside. 4. Dredge sticks a few at a time in the egg, then roll in the crumb mixture. Place the sticks on the prepared baking sheet. 5. Bake sticks for 12 minutes, turn over and bake for an additional 8 minutes, until golden brown and crisp. 6. Serve immediately, with the sweet onion dip.